Nine esteemed colleagues and I collaborated with Friends of ED editor Chris Mills to create a book called Web Standards Creativity , which will be released early in March. It is poised to infect the minds of innumerable readers with several creative approaches to standards-based web design and development. These progressive ideas in XHTML, CSS, and DOM scripting could single-handedly set back the cause of mediocrity several years. My contribution is a mix of typographic history, theory, and technique, aiming to spread principles of timeless, classic typography further into the web design world. If this stuff catches on, people might actually begin to enjoy reading online. MySpace is justifiably alarmed. Download the PDF, print it out, and write your e-mail address on it. Upon being found, each author will mark his surrender on your sheet with a unique rubber stamp. When you collect the last of the ten stamps, we’ll note the date and time and keep your completed sheet. 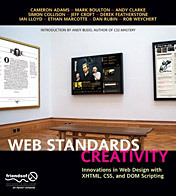 The first ten people to successfully complete the mission will be sent a free copy of Web Standards Creativity . I’ll be a sitting duck. As if I wasn’t already easy enough to pick out in a crowd, this year I’ll be up on a stage. Jason Santa Maria, Cameron Moll and I will be giving a presentation called After the Brief: A Field Guide to Design Inspiration, in which we’ll share our methods for defining, locating, and maintaining creative inspiration in our personal and professional lives. Come see us on Saturday, March 10th, 11:30 AM, in Room 18ABCD, and claim your place in the history of criminal justice! Rob, this is on my very-highly-anticipated list. Roll on 19th March! My first SXSW (despite living in Austin every year of its existence) and I get a crazy manhunt mission! Elliot: I don’t think you’ll be disappointed. Please let me know what you think once you’ve had a chance to read it! Terry: What in the world have you been waiting for?! As lame as it sounds, I started this while at SXSW but never completed it. I guess, between doing the panel thing and goofing off, I just lost track of time and lost interest, even if that meant a free book. It's cool though because I'll just buy it when it surfaces at B&N. By the way, it was great meeting you Rob. Nice thing is we won't have conflicting panels next time.